… we were continuing our focus on eliminating the noise around collaborative technologies and tools. As we thought about how to best represent collaboration, one of my colleagues simplified the problem (paraphrasing slightly): “It’s not about the direction of the information flow, it’s about the number of contributors and the number of information consumers”. I thought about it again and the writers (contributors) and readers (information consumers) seems like a nice progression in describing our thinking, particularly when we overlay the business use and tool types in the context of collaboration. A simplifying assumption I have found in a number of problems being represented by mental models and frameworks is to look at the end points. In our practice we have a laser focus on business outcomes (results). So, we can think of a continuum of issues which range from those involving single information consumers (e.g., my boss for my daily work) to the entire enterprise and external stakeholders information consumers (e.g., the annual report). Likewise we can simply state there are solutions which require single contribution (e.g., my day’s work) and those which require many thousands (e.g., our customers/consumers feedback on new products). In the middle- contributors are focused on generating work product for information consumers focused on consuming business outcomes. We have spent some time to explore the dimensions required to achieve these outcomes through collaboration in an earlier post. Now we are focused on detailing and positioning some common business outcomes relative to 1) their writers and readers and 2) some of the collaborative tools currently available. When we think of projects, we select the best resources based on skill, expertise, development, etc. For a directed community enabled by collaborative technologies the same selection requirements remain, but some of the typical constraints may be relaxed or eliminated. For example, we may be able to bring in expert resources from divisions halfway around the world to contribute, because they do not have to travel and they can work when they have time, within the project’s window for their contribution. These business activities can be enabled to allow a broader community to contribute (collect, build & organize) and potentially consume (distribute) information. Expanding on our previous post, the enabling tools can be mapped against typical number of contributors and typical number of information consumers. 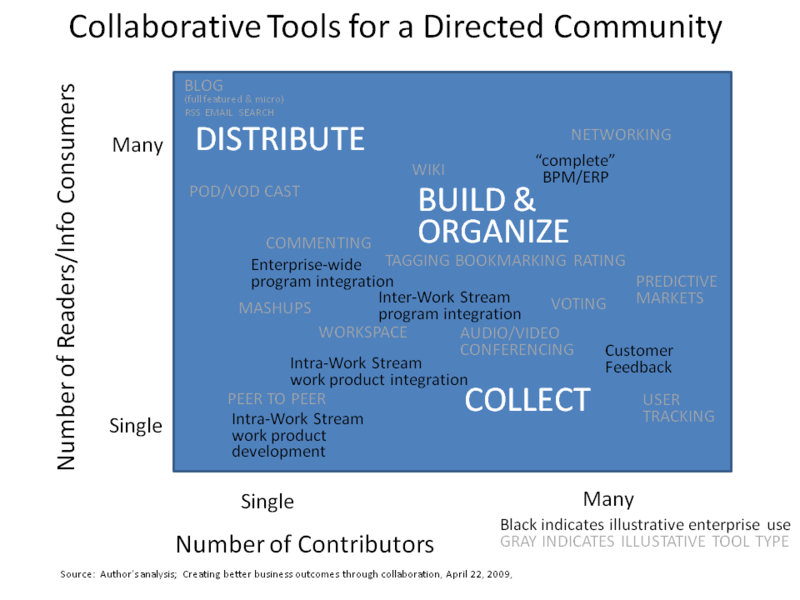 We continued this thinking to include more specific business applications within the enterprise to generate the Collaborative Tools for a Directed Community. We believe taking a more collaborative approach is central to providing a foundation for the high performance organization of the future. We believe there are opportunities right now to increase project and process performance. And, in the near-term, for example, as the boomers retire, we believe there is an opportunity for organizations to capture their learning, to BUILD & ORGANIZE (codify) the information they may take with them without proactive interventions. Furthering the example, there could be very simple structures to reach out to retirees as a directed community, at their convenience and interest to contribute to issues and questions of those currently manning the guns.